Situated only a few blocks from the white sand beaches of the Gulf of Mexico, Citadel Apartments of Venice offers the best of Florida luxury living at a reasonable rate. Welcome Home. Our newly remodeled, gated apartment community is serenely situated on picturesque Venice Island in sunny Florida. Newly remodeled one and two-bedroom apartment homes provide our residents the best of both worlds: the comfort and style required for a lazy day at home, and close proximity to all the fun and sun Venice has to offer. 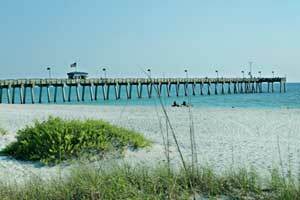 Wake up at Citadel Apartments of Venice and smell the fresh Gulf breeze. Brew freshly ground coffee in your well-appointed kitchen and prepare for a great day. If you wish, take a morning stroll to Venice Beach where you can hunt for prehistoric shark’s teeth; or instead relax on the tanning deck next to our resort-style swimming pool. Now that you’re awake you can make your way to our newly outfitted Fitness Center and enjoy a great workout session; or you may choose to take advantage of the more than 20 miles of bicycling paths in and around Venice. Is it time to take care of some business? No problem. Head to our Business Center where we are equipped with a PC and plenty of room to work. After all that you must have worked up an appetite! Eat at one of the great restaurants in Venice or stay in and cook your favorite dish in your stainless steel and granite kitchen. How you choose to spend your day is up to you but it should always begin at Citadel Apartments of Venice. Become a part of the friendly community of Venice where boutique shopping, galleries, watersports, biking and beach activities are a way of life. Contact us to schedule a showing or call our Leasing Office today!